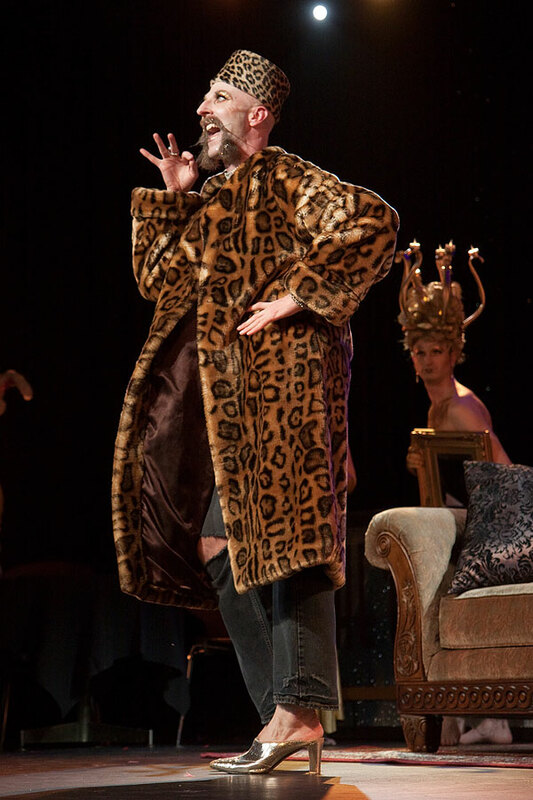 It was a wonderfully eclectic and bubbly packed house at The Triple Door, which greeted the yearly return of a show which has quickly become an unconventional Seattle favorite, Lily and Jasper’s “Through the Looking Glass: The Burlesque Alice in Wonderland”. As if Lewis Carroll’s heavily symbolic tale could become any more peculiar, Lily Verlaine and Jasper McCann take serious creative license and drive the original vision headlong into uncharted waters, by producing a thoroughly entertaining, artistic and polished burlesque retelling of the classic coming of age account of Alice which continues to engage and delight audiences. The story opens with a grown Alice, played by the captivating Inga Ingénue, alone in her room musing about the tedium of life until she catches a reflection of herself in the looking-glass. She is drawn to her reflection in the mirror which seems alien to her. Instead of her golden hair, the reflection is adorned with tresses of black. Even Alice’s black and white dress is mirrored in reverse. As fanciful tales so often do, the impossible becomes possible and her curiosity leads her to pass through the looking-glass to a vibrant wondrous world which is anything but tired and familiar. There she meets the black-haired reflection of herself, played by the charming Lou Henry Hoover, who acts as her guide through wonderland. Ingénue, a master of her craft, and Hoover were wicked perfection together, playing off of each other as the two versions of Alice. Their emotive “Feathery Fantasy” routine was soulful and memorable. Verlaine and McCann’s reimagined wonderland lays somewhere between a truck stop diner and a never-ending Vegas-style dinner show hosted by the White Rabbit himself, brought to life by the irrepressible Jasper McCann. McCann tactfully keeps the show from getting bogged down with his quick asides to the audience and presence of mind to keep things moving. He evoked a Tim Curry like feel to his performance and depended more upon his natural charisma and stage presence than vocal talents to successfully pull of his slightly over-the-top lounge lizardy ballad, “White Rabbit Blues”. The diner aspect is completed with waitresses Eat me (Kissee Simmons) and Drink Me (Polly Wood). Kissee Simmons comes out of forty years of retirement to distinguish herself as a crowd favorite wise cracking waitress made up to look and sound like Heath Ledger’s portrayal of the Joker. As in the original tale, Alice is confronted by a wide variety of strange and bizarre characters, leading her to her final confrontation with the Queen of Hearts herself. While the show shines from top to bottom with its choreography and inspired performances across the board, there were many standout moments throughout the evening. Verlaine’s mesmerizing portrayal of the Caterpillar, especially during “Metamorphosis” with Trojan Original, together they held all observers spellbound. As the Red Queen, Verlaine’s playfully sensual fight sequence with the White Queen (Kitten La Rue) succeeded in delivering on every adolescent fantasy of the purr-fect cat fight. Speaking of cats, Waxie Moon’s unforgettable and inspired portrayal of the Cheshire Cat stirred the audience into a near frenzy. Other inspired performances were delivered from Miss Indigo Blue (The Mad Hatter, Tiger Lily & the Duchess), Babette La Fave (Jabberwocky and Tweedle Sister) and a brilliant ensemble cast which did not disappoint. I would be remiss if I did not call out the extraordinary talented dance trio, the TriBellas (Christina Amadeo, Janice Richardson, and Juwana Hodge). They brought their unique energy, infectious charm and outstanding routines as the Mushrooms and Flamingos in “Among the Mushrooms” and “Croquet Coquettes”. Verlaine and McCann succeed in delivering a tasteful, polished and entertaining romp through wonderland. The current show at The Triple Door runs through Saturday, September 15th with two shows on Friday the 14th and two shows on the 15th. For more information about the show, check out http://www.burlesquealiceinwonderland.com. If you miss out on this year’s performance, it is a safe bet that you will see the show return next year around this same time. Until then, you might consider checking out Lily and Jasper’s production “Land of the Sweets: The Burlesque Nutcracker” which opens at the Triple Door this holiday season.